The 2018 Light Up a Life appeal is set to get star billing at Barnstaple’s Christmas Lights switch-on this Sunday (November 18). The 22nd annual joint fundraising appeal for Children’s Hospice South West (CHSW) and North Devon Hospice (NDH) will be launched on the big stage at 5pm, before the main switch-on at 6pm. Families who have been supported by the two hospices will light a giant star in the Square; stars will also be lit at each hospice and at the office of the North Devon Gazette office, which has supported the appeal every year since its inception. Braunton singer Sophie Kerslake will sing a carol while the main star is lit and will then be joined by young singers to perform gospel carols after the families are given the chance to speak about why the appeal and the charities are so special to them. Barnstaple teenager Sam Walter has been receiving support at CHSW’s Little Bridge House in Fremington since he was five years old. He will be joined on stage by mum Jo Boydd, who will be speaking about how the children’s hospice has made such a difference to their lives. Jo said: “A lot of people would want to wrap a child like Sam in cotton wool and say he’s poorly, he’s frail, he’s life-limited and has got lots of problems. But he’s actually a really happy little chap and coming to Little Bridge House, where it really is all about making the most of life, is just perfect for him. He absolutely comes alive with all the attention, the resources and the facilities that are on offer. Many families have been supported by North Devon Hospice this year, including the Cameron family from Barnstaple. Jamie Cameron said: “Our Dad Eddie was a wonderful husband, dad, grampy, father-in-law, brother and friend. The Light Up a Life Appeal was launched in conjunction with both hospices in 1991 and has raised hundreds of thousands of pounds for the two charities. 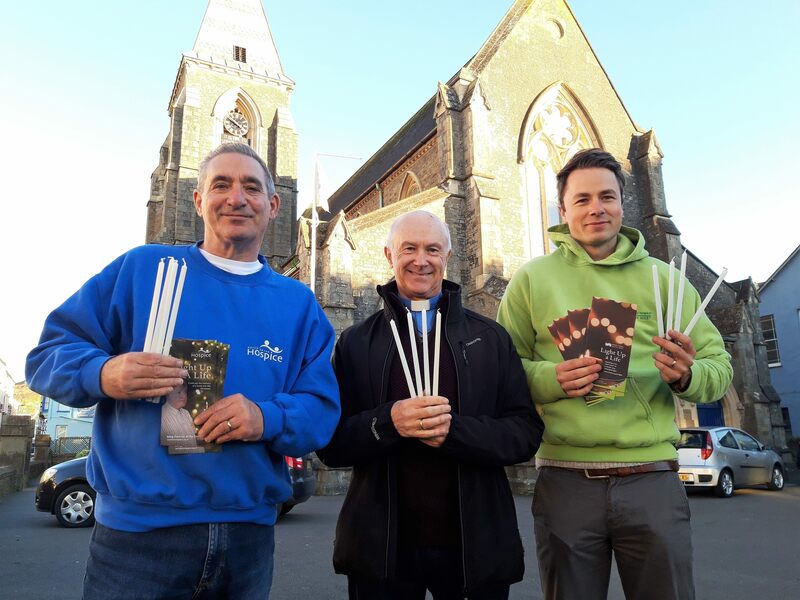 A series of 18 special – mostly church – services will be held around the region during the first two weeks of December, starting at Ilfracombe’s Pip and Jim’s (St Philip and St James Church) on December 2 and finishing at Torrington Methodist Church on December 16. A complete list of services is available here. Light Up A Life started out in Barnstaple on the Square and moved to Grosvenor Church before the services were broadened out to reach more communities. The Ilfracombe service at Pip and Jim’s (St Philip and St James Church) is one of the longest-running in the appeal’s 22-year history and the Reverend Clive Thomas said it was a ‘great privilege’ to be able to carry on the tradition and support the two hospices. “I’m very much looking forward to holding this year’s first Light Up a Life service in Ilfracombe on December 2,” he said. The church will be full of Christmas trees as our Christmas Tree Festival starts on November 23, so this will be a very special way to remember a loved one at this time of year. “People genuinely care about the charities; you meet very few people who don’t know someone who has been helped by one of the hospices. Emma Perry, CHSW fundraising manager, said the appeal was always such a special and meaningful way for the charity to raise much-needed funds to support children and families using the hospice. “Christmas can be such a poignant time of year, both at Little Bridge House and for our supporters out in the community,” she said. Our Light Up a Life services provide our community a special time to remember their loved ones and celebrate the memories of their lives, many of whom themselves supported CHSW and the work we do. Gerard Fawcitt, from the NDH fundraising team, said: “As we approach the Christmas period, we may all be looking forward to the celebrations, but it can also bring up mixed emotions as we think of loved ones who are no longer with us. “We would love for you to join us this year at one of our special services running across North Devon throughout December; which we hope will help bring you and your family some comfort over the festive period. Your support will make a huge difference to patients and relatives who we are supporting, both over the Christmas period and in the years ahead. "We hope you will join us to remember someone close to you this December and support the vital care our hospice provides to those suffering with life-limiting illnesses across North Devon. You can make an online donation to CHSW or NDH in memory of your loved ones. You can also call CHSW on 01271 325270 or NDH on 01271 347232 with your donation and loved one’s name. The name(s) will be entered into a special Light Up a Life book of remembrance, which will be available to view at Light Up a Life services throughout December. New this year, you can also make a text donation that will be split equally between both charities. Simply text LUAL10 £(enter amount) to 70070 to make a donation. You can also support CHSW by buying one of our limited edition Light Up a Life candle holders, handmade especially for us by a local blacksmith.